La Fête Franglais is back at Hat Fair, on 4th and 5th July 2014 in Winchester, with even more UK and French companies presented. This year, Hat Fair artistic director Kate Hazel has collaborated with Julie Laville, Dance, Circus and Outdoor arts Officer at ZEPA 2 French partner Culture Commune to jointly develop the Fête Franglais artistic programme. ...who have toured in various towns in Hampshire as part of the Hat Fair Out There touring programme and will complete their journey in Winchester. ...whose new show Grime, presented at Hat Fair this year, has been supported by Hat Fair, SeaChange Arts and Atelier 231 and who took part in an intense outreach programme with Atelier 231. ...who have been involved in various projects as part of the ZEPA 1 and ZEPA 2 projects. 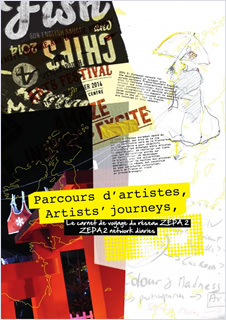 A nice selection of companies who have been supported by the ZEPA 2 network...and have printed their footprints on the European Zone of Artistic Projects area !